Root Fungi are an inspiring phenomenon and the stimulus for these drawings. Mycorrhizae are a type of fungi that have a mutual symbiosis with the root system of almost every plant and tree on the planet. The fungi fit like a glove over plant roots. About 90% of plants and trees obtain their mineral nutrients with the help of these fungi. In return, plants provide sugars from their leaves to the fungi. This relationship started 400 million years ago when the first land plants originated. The interaction between the first struggling, one-celled land plant and the fungi is said to be responsible for the plant’s ultimate viability. This ongoing and mutualistic relationship between plants and fungi is literally the underpinning for the success of plant life on earth. The infinite numbers of microscopic networks are inconceivable. They provide vitality, energy, and life indiscriminately. The prints that came from this inspiration, express the kinetic, pervasive, power of lines and networks....the life force, the animation, the vibration, the potential power of connection. The “line bodies” dance, move, lie, disturb, sustain, collect and connect. 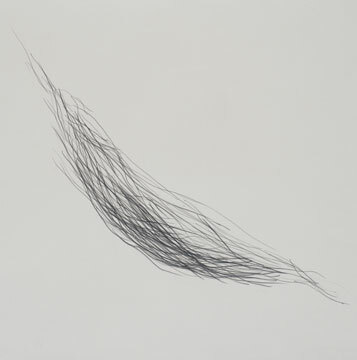 My lines are an exploration of movement and energy. They seem alive. I am mystified by the sheer existence of these networks underground and aim to symbolize their activity, movement, and strength through these images.